1.1. The objective is to provide a twice-monthly inter-branch team and individual show jumping competition for all Area 5 branches from September to March each year, referred to below as the “season”, in five jumping height classes, involving as many Area 5 members as possible and providing a framework to encourage a competitive spirit and continuous and consistent improvement in riding ability. 1.2 The season will be deemed to have started with the commencement of the first such competition. 1.3 The most successful team and most successful individual in each class will be awarded a cup at the end of the season. 1.4 An Area 5 Winter League Show Jumping secretary will be appointed by the qualifying branches at the commencement of each season, such secretary being responsible for compiling and up-dating a league table after each competition and publishing that table to those branches. Where no secretary has been appointed or, having been appointed, is unable to fulfil the role, the Area Representative will be appointed. 2.2 Where an age restriction applies to any class, the age of a rider will be taken as at the 1st January of the year in which the season in question commences. 2.3 Each class to be organised under current Pony Club Show Jumping Rules, with each rider attempting two full rounds and no 3rd round jump off. The second round of each rider will be timed. 2.4 Rosettes to be awarded to 6th place and prizes awarded to 3rd place in each class for both teams and individuals with branches endeavouring to maintain broad parity in value with each competition. 2.5 Teams and individuals placed in the first six places in each class will be awarded Winter League points on an equal descending scale of 6 points for first place and one point for sixth place. 2.6 Where nominated Winter League teams are placed below non-Winter League teams, no account is to be taken of any such non-Winter League teams when deciding places and points under rule 2.5 above. The league is open to any branch or member of a branch which organises a competition during the relevant season. Branches may be permitted to organise a competition in conjunction with a second branch with the approval of the Area 5 Representative and subject to that arrangement being agreed and declared 14 days before the start of the season. Each qualifying branch may enter one team only in each Class at each competition. Branches may be permitted to enter a team in conjunction with other branches with the approval of the Area 5 Representative and subject to that arrangement being agreed and declared 14 days before the start of the season, to be known as a Combined Team. A branch which has not entered as a Combined Team may also enter additional teams as “non-Winter League teams” but where they do so, they must nominate which is their WL team upon entry and all other teams will be designated “non-WL teams”. 5.1.5 A team member may compete in different classes at different competitions during a single season. 5.1.6 They must not have competed for another Area 5 Branch in a Winter League Show Jumping team in the same season. 6.1 All horses and ponies must have genuinely participated at a minimum of three working rallies organised by the branch which that team member represents since the 1st January of the year in which the relevant season commenced with a member of the Pony Club. 7.1 Branches proposing to organise a competition will announce a date at least three months prior to the commencement of the season upon which they propose to hold a qualifying competition. Where two or more branches announce conflicting dates, they will attempt to resolve the conflict between themselves failing which the Area 5 Representative will resolve the conflict and that resolution will be final. Ideally there will be no more than two competitions each calendar month with at least 12 days between each such competition. 7.2 Where it becomes necessary to cancel and/or re-arrange a competition, the organising branch is free to select any other date which will not conflict with a previously announced date and ideally comply with rule 7.1 above. 7.3 The organising branch(es) is/are responsible for arranging a suitable venue and all other arrangements, including fixing the entry fee. 7.5 The organising branch shall start the first round of each class with the team representing the host branch(es) followed by other competing branches in an order which gives regard to the distance likely to have been travelled by their team members. 7.6 Winter League teams should jump prior to any other teams or Individuals. 7.7 In the first round the whole team will jump in succession. 7.8 It will be for the organising branch to decide the order of jumping for the second round and the order selected must be published in the competition schedule. In the event of the organising branch not publishing the second-round order in the schedule, the order will default to 7.9.1 below. 7.9.2 The team members to jump one at a time, one from each team, in the order they jumped in the first round sequentially. 7.9.4 Such other order as may be decided by the organising branch. 7.10 The result of the team competition will be decided upon the total number of faults incurred in each of the two rounds by the three riders incurring least faults in each of those rounds, the team with the least number of faults being the winner. In the event of equality of faults incurred, the least time taken to complete the second round by the three riders whose faults were counted in that round will be the deciding factor. 7.11 The result of the individual competition will be decided in accordance with Rule 8.12 below. 7.12 The organising branch shall publish the result of each class in writing by displaying a full list of riders, faults incurred and provisional placings on a noticeboard where they can be readily seen by competitors at least 15 minutes prior to the presentation for that class to allow time for objections to be made and/or errors to be corrected. 7.13 The organising branch shall appoint a jury of appeal consisting of the District Commissioner of the organising branch or the competition organiser, one of the judges and the Area 5 Representative. If the Area Representative is not available then the D.C. of a visiting branch not directly involved in the appeal may be invited to join the jury. 7.14 Protests and Objections will, as far as possible and consistent with these rules, be dealt with under the relevant paragraph of the Pony Club Show Jumping Rules in force at the time of the commencement of the season in question. 7.15 The organising branch shall, within 7 days of the conclusion of the competition, send a copy of the results, to include a full list of riders, faults incurred and placings, to other competing branches and/or publish the results on their website and in any event shall send a copy of those results to the person appointed as secretary of the league within 7 days of the conclusion of their competition. 8.1 Branches are encouraged to organise their competition to include provision for non-Winter League teams and Individuals to compete. 8.2 At the absolute discretion of the organising branch, a rider may compete on more than one horse or pony at a single competition or in a single class but where that rider is a member of a Winter League team or is competing as a Winter League individual, he/she must compete as a member of that team or as an individual, before riding a second or subsequent horse or pony unless the course for the relevant class or classes preceding the relevant Winter League class are substantially different, ideally incorporating at least one different obstacle. However, the addition of a single obstacle within the course or at the end of the course without altering the route of the course itself would not be sufficient to make the course “substantially different”. 8.3 If a competition includes non-Winter League teams then such teams should always compete after the Winter League teams in the first round. 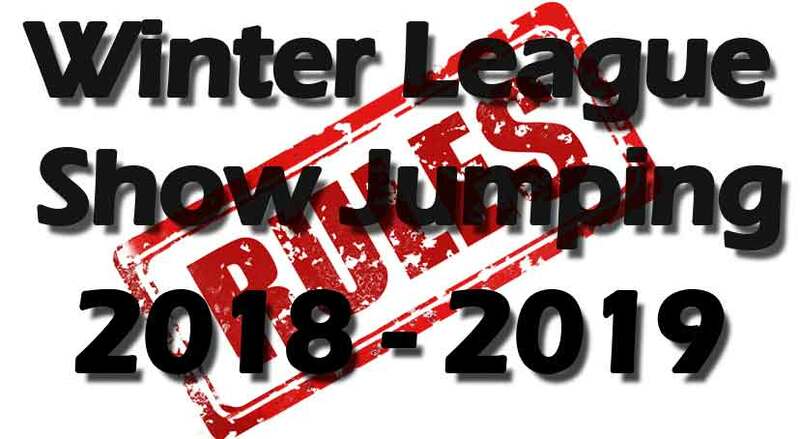 The same rule regarding order of jumping should be applied to non-Winter League teams as it is to Winter League teams, that is host branch followed other branches having due regard to distance travelled. 8.4 If a competition includes Individuals, then such Individuals should always jump after the Winter League and non-Winter League teams in each round. 8.5 Where a competition is over-subscribed resulting in some entries having to be refused, the organising branch must give priority to Winter League teams over non-Winter League teams and Individuals where the entries have been received prior to the announced closing date for entries. 8.6 The organising branch may place Individuals into non-Winter League teams at their absolute discretion and may, but need not, take account of branch membership when doing so. 8.7 Regardless of Rule 8.4 above, competing branches have the absolute right to include a qualifying member of their branch in a branch Winter League team where the number of members of such a team falls below the maximum number of four subject to such inclusion being notified to the competition organiser prior to the commencement of the Class in question. 8.8 In the event of a non-Winter League team having less than four members as a result of the operation of rule 8.7 above, the organisers have the absolute right to include an Individual in such team subject to such inclusion being announced prior to the commencement of the Class in question. 8.9 A Class is deemed to have commenced when the first rider has entered the arena for the first round of that Class. 8.10 Non-Winter League teams will be as equally eligible for the award of rosettes and prizes as Winter League teams and for this purpose there shall be deemed to be a single team competition involving all Winter League and non-Winter league teams although non-Winter league teams will not be awarded points – see rules 2.5 & 2.6 above. 8.11 An Individual competition will run alongside the team competition in each class and all team members and other Individuals entered in that Class will be eligible for Individual Awards of rosettes to sixth place and prizes to 3rd Non-Winter League Individuals will be as equally eligible for the award of rosettes and prizes as Winter League Individuals and for this purpose there shall be deemed to be a single individual competition involving all Winter League and non-Winter League Individuals although non-Winter League Individuals will not be awarded points – see rules 2.5 & 2.6 above. 8.12 The result of the Individual competition will be decided upon the total number of faults incurred in each of the two rounds, the rider with the least number of points being the winner. In the event of equality of faults incurred, the least time taken to complete the second round will be the deciding factor. 8.13 At the final competition of the season, Area 5 Champion and Reserve Champion rosettes will be awarded to the Teams and Individuals in each Class who are placed 1st and 2nd respectively based upon the total number of points accumulated during that season. 9.1 The organising branch is responsible for all Health and Safety issues at their competition and should take all reasonable precautions to ensure the health and safety of everyone present. All members and others attending must take reasonable steps to avoid and prevent accidents and must obey the instructions of the organisers, officials and stewards. 9.2 The organising branch must carry out a risk assessment before the commencement of the competition, but organisers should issue a disclaimer of liability both prior to and at the competition. 9.3 Any member who is riding a horse or pony which is considered by the organiser, an official or steward to be unsafe in any respect either for that rider or for any other person present, or any person who is acting in any way which is considered unsafe, should be spoken to discreetly and, if appropriate, prevented from taking any further part in that competition and may be asked to leave the venue. DISCLAIMER OF LIABILITYSave for death or personal injury caused by the negligence of the organisers or anyone for whom they are in law responsible, neither the organisers of this event nor the Pony Club, nor any agent, employee or representative of these bodies accepts any liability for any accident, loss, damage, injury or illness to horses, riders, owners, spectators, land, cars, their content and accessories or any other person or property whatsoever, whether caused by their negligence, breach of contract or in any way whatsoever. HEALTH AND SAFETYThe organisers of this event have taken all reasonable precautions to ensure the health and safety of everyone present. For those measures to be effective, everyone must take all reasonable steps to avoid and prevent accidents occurring and must obey the instructions of the organisers and all officials and stewards.